DogsBite.org, a national dog bite victims group, found that 35 percent of all dog bite fatalities in 2016 involved two or three dogs and 26 percent involved a pack of four or more dogs. Dog bite attacks involving more than one dog create unique challenges, since it's not always readily apparent which dog was the aggressor. If you were attacked by multiple dogs or injured while trying to defend your own dog, there are three different approaches your attorney might recommend for establishing liability: behavioral analysis, teeth width, and DNA testing. Behavioral analysis can be used to establish liability by inferring which dog was most likely to have caused the injury based on temperament and breed. Temperament refers to any past known behavioral problems associated with the animal. A dog who is known to be aggressive towards strangers or children would be more likely to attack than one with no previous problems. However, since California has eliminated its previous "one-bite" rule, it's important to keep in mind that an owner is still liable for the injuries a dog inflicts even if the animal has never shown any indication of aggressive behavior. While breed alone doesn't make a dog guilty, there are certain breeds that are physically more likely to cause severe harm when they attack. For example, any Pit Bull breed has tremendous crushing power in the animal’s jaws. These dogs are much more capable of harm than a small breed such as a Shih Tzu or Bichon Frisé. Rottweilers, Huskies, wolf hybrids, Bull Mastiffs, German Shepherds, Dobermans, and Akitas are also known for their ability to inflict great physical harm when they attack. When examining the dogs involved in the attack, taking teeth measurements can help establish responsibility for injuries. You can compare the width between a dog's upper canine teeth and the width between the two lower ones to the width between the puncture wounds on the victim's skin. However, for this approach to be effective, the measurements of the bite wounds must be taken before they have begun to heal. DNA testing isn't just for cases involving human suspects. In an animal bite attack, it’s possible to match DNA from the saliva on the victim's clothes to a blood sample taken from each of the dogs that were involved in the attack. DNA testing isn’t necessary in every dog bite case, but can be helpful when the attack involved dogs of the same breed or a similar size and temperament. If evidence indicates that the victim was bitten by two dogs owned by different people, both owners can be named as defendants in a personal injury claim. Dog owners are responsible for the conduct of their pets regardless of how many other dogs are present when an attack occurs. In the event of a fatal dog bite attack, the spouse, parent, or children of the deceased victim can file a wrongful death claim. This is a type of claim seeks to recover compensation for funeral and burial costs, loss of financial support, as well as the suffering from the loss of society and companionship of the deceased person with the person's loved ones. 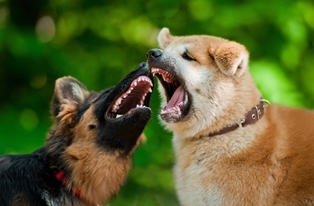 In most cases, a dog bite claim is paid from the owner's homeowner's or renter's insurance coverage. However, you are still entitled to compensation even if the dog's owner does not have applicable insurance coverage. The challenge with recovering from an owner instead of an insurance company is that in many instances the owner may not have assets to be used to pay for the damages suffered. The legal team at Inland Empire Law Group is committed to helping California residents receive fair and timely compensation for their dog bite injuries. If you or a loved one have been hurt in a dog bite attack, please call today to schedule a consultation at our Victorville or Rancho Cucamonga offices.